Geochemical surveys of obsidian sources in the western United States and Canada. Trace element studies of significant artifacts and sites that would otherwise receive little attention. Exploration of methodologies useful in the interpretation of trace element provenance information. The use of the World Wide Web to present information related to obsidian studies. Some of the reports and articles resulting from this research are, or soon will be, available for downloading as Adobe Acrobat .PDF portable documents. PLEASE NOTE THAT THIS SECTION IS CURRENTLY OUT OF DATE AND IS SCHEDULED FOR A MAJOR OVERHAUL. A view of the not so dry Dry Creek drainage, southeastern Oregon, a tributary to the Owyhee River. 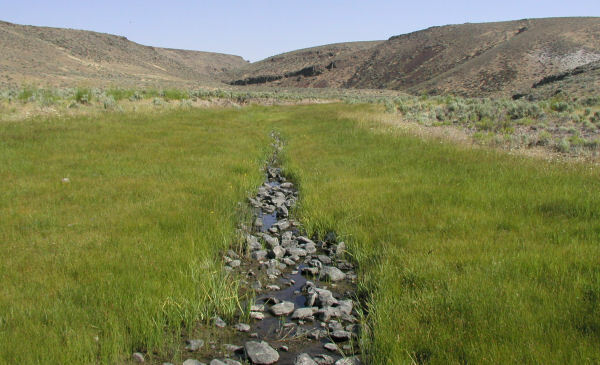 This well-watered drainage likely served as a prehistoric travel corridor between the Harney-Malheur Basin and destinations to the east.